So I made step by step photos of this process for y’all and somehow I deleted them off my camera. Seriously, sometimes I don’t know how I don’t loose my own head. Thankfully these are SUPER simple and some simple directions will work just as well. I gave these cupcakes away to the neighborhood kids as they got off the bus. The bus stops in front of my house every day — so I decided to take advantage of it. I was worried the kids wouldn’t take a cupcake from a strange lady waiting for them to get off the bus…but apparently the Monster Cupcakes won them over. I didn’t have a single cupcake left! 1. A batch of your favorite cupcakes. For the buttercream frosting, I used the jumbo round tip from this Best-Ever Cupcake Icing Kit. For the eyes: Microwave 3 white candy melts on a small plate. Using a toothpick, put a little melted candy melt onto the back of an M&M and stick it to a candy melt. Let dry for about 5 minutes so the M&M doesn’t move or fall off. Then place it on the cupcake in the center of the frosting. For the hair: Pull off pieces of the cotton candy and press together on the bottom to hold it together. This is easier to do with fresh cotton candy, but can be done with the kind in jars…it just takes a lot of work. Then stick the hair into the top of the buttercream. And you’re done! Eat/serve these immediately. The cotton candy only stays pretty for so long. After about 15 minutes, it will start to turn sticky and melt. These are so precious! 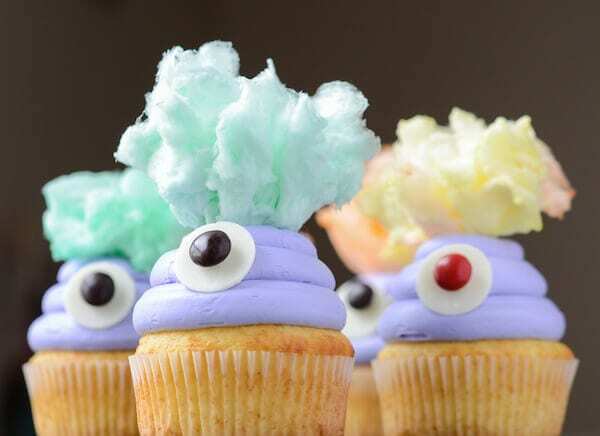 I love that cotton candy hair, and I especially love the one cupcake with the crossed eyes in the last photo, haha. Cute and easy idea! 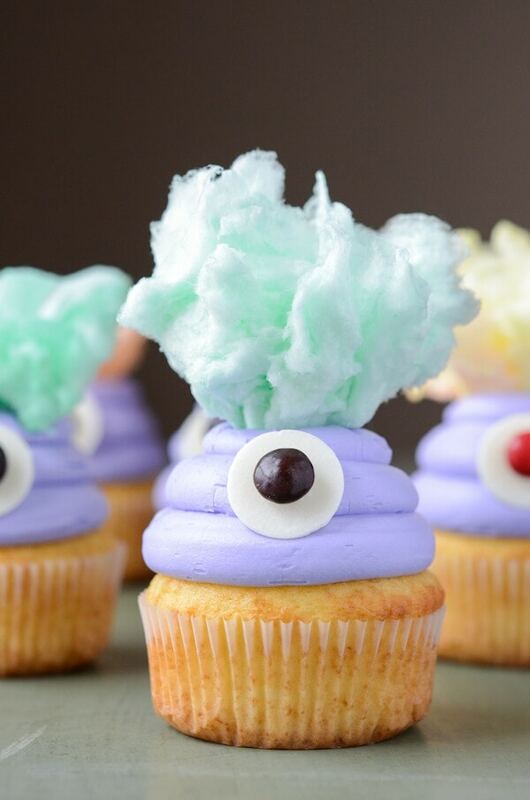 Seriously – I squealed with joy when I saw these, I couldn’t even imagine what you were using cotton candy for! These are amazing!! Oh my freaking goodness! These are the best – soooo cute Jess! these cupcakes are just AMAZING!!! Seriously, they are! Who knew monsters could be so cute!? These are so dang cute! Your neighborhood kids are so lucky – I bet you made their day as they got off the bus! These are probably the CUTEST cupcakes I’ve ever seen. Ever ever. Ok, first, I love that you handed these out to the kiddos. 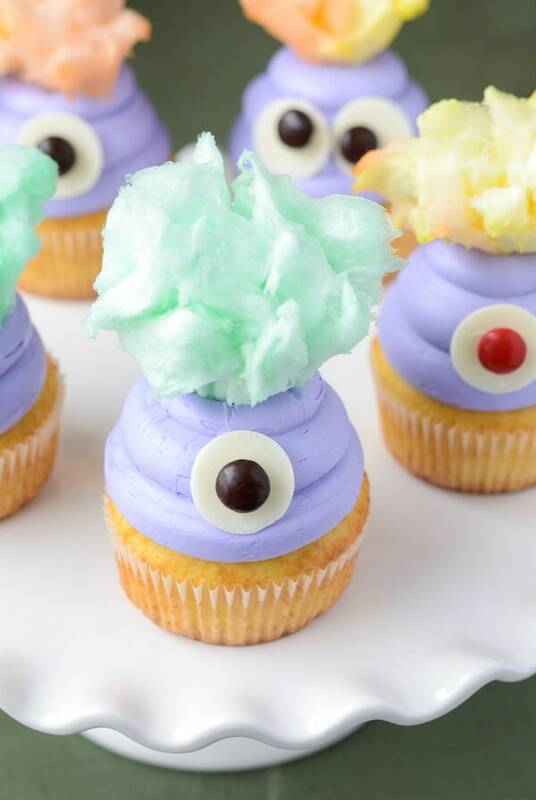 And second, these are the most adorable cupcakes EVER! I love the cotton candy! Awwwww, these are soooooo cute! Love them!!! I couldn’t wait to see this on your blog since you started asking about where to find cotton candy on Facebook. This is a FANTASTIC idea! Now I have that One-Eyed, One Horned, Flying Purple People Eater song in my head! Love these! Love these!!!! I think Sebastian will enjoy next week’s cooking project! Thanks for some awesome ideas as always. These are, like, the cutest things EVER! Oh my gosh. Cutest thing I’ve seen on the web all season. LOVE THESE!!! Oh my goodness, WHERE were you when I was a kid?! I would have tackled you and taken all of these cupcakes right off the bus, lol! And then I would have felt bad and helped you up… Amazing treat for Halloween, Jess! Oh my gosh, these are too adorable!! Okay this is just too stinking cute man! I’m curious what cupcake recipe you used for these cupcakes? They look very yummy!